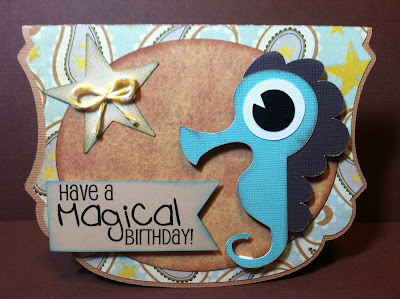 Paper Crafts by Candace: Have a Magical Birthday! Hey Everyone! So for those of you who follow me on Facebook know I just got a Cameo on Friday! First impression of the Cameo and Silhouette Studio... Amazing! I thought I was going to be so overwhelmed and would need tons to learn how to use it but really I just played around alittle but and I already feel pretty comfortable navigating it. I know there is still tons for me to learn but I'm happy for now! :) And the cameo cuts sooooo much smoother than the Cricut! Those little details are perfect. If I could cut my Disney cricut cartridges in the cameo I would actually use them! I love the shape of the card and seahorse is so adorable. Great job! How is it with circles and scallops? The wonky circles that look more like ovals on the Cricut drive me nuts. Have you tried Paper Layerz or Cut Mates for the Disney cuts with the Cricut? I cut some very very tiny Eeyore earring with them (though I did eliminate a lot of the cuts with my Gypsy's hide contour feature) but they cut out like buttah. This card is super cute! I am excited to see what else you create on the Cameo! What a sweet card! I was just looking at the cameo last week when I dropped my sewing machine off for a tune up, I am so tempted to get one, but I wish I knew if it would cut all my svg files I have purchased over the last year. Very very cute!!! Looks great! I can't wait to see more. Adorable card. I love anything that has the ocean theme.